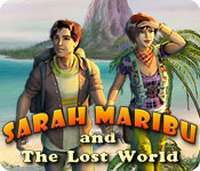 Sarah Maribu and her brother Michael are two archaeologists and explorers, that arrive by helicopter to an uncharted island and start to investigate the temples and other structures of a lost civilization. This is a hidden object game with elements of the adventure genre. Most of the time, the objective is to find and click on all the items shown as pictures on slots at the left side of the screen, on locations filled with assorted paraphernalia scattered throughout the scenery. The hint button shows the position of one of the required items, but takes thirty seconds to recharge after use. Some of the objects are stored inside the inventory, to be used later when solving puzzles. The inventory can be accessed through the tools button at the bottom-left corner, sliding upwards to reveal all of its compartments. The objects have to be used as in most point-and-click adventures, by dragging and dropping them over logical places to perform an action or complete a task. Some of the objects can only be found inside one of the interactive windows showing another angle of the location, that appear after clicking on certain hotspots. There are mini-games between each chapter, like the Simon implementation where the player has to repeat a color sequence in a set of drums, the weights puzzle where statuettes have to be distributed on columns to reach equilibrium, and other similar challenges.